Look at these lovely stamps from Clearly Besotted, a new stamp company launched by the very talented Stephanie Wincott and her sister Jenny. To celebrate the launch of their stamps, there is a giveaway on Stephanie's blog, Stamping & Sharing. Leave a comment before 12 October and you could win some fabulous blog candy. My stamps were in my hot little hands within 24 hours of placing my order, and I knew exactly what I was going to make with them. 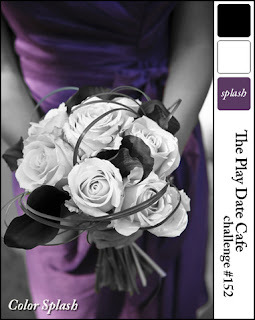 The challenge at The Play Date Cafe is black, white and a splash of plum. And the challenge at One Layer Wednesday, hosted this week by Susan at Simplicity, is to make two cards, using the same stamp two different ways. On the multiple images card I stamped the butterfly in Encore Ultimate Metallic Purple (the nearest I had to plum), and then stamped three more times without re-inking. Through trial and error (read: after several botched attempts), I found that I couldn't get a decent fifth image, so I re-inked, then stamped off three times to get another fourth image. I added some tiny 2mm crystal AB gems from Meiflower on the main butterfly. For the single image card, originally I was going to colour in the butterfly, but I do like monochrome, and couldn't bring myself to spoil it, so I just added the gems as per the multi image card. But the stamp set has two more butterflies, and it would have been rude not to give them the same treatment :) The blue is Encore Ultimate Metallic Blue. This next pair was actually my original attempt, but it turned out more pink than plum. The ink used was ColorBox Dark Peony chalk ink. I think this one's my favourite. I've also bought the Christmas set, and I can't wait to use it! love the generational stamping! so pretty, Shirley! So gorgeous, Shirley! Love these cards. These stamps are gorgeous, and so is the way you have used them. These are stunning cards, Shirley! Love the generational stamping! Thanks for joining in this week's Play Date Cafe Challenge! Beautiful! LOVE all of the colors you used for your butterflies! Gorgeous design! Love the different shades of purple you used. Thanks for playing along with us at The Play Date Cafe! I LOVE using butterflies on cards. These are wonderful clean and simple cards! Such neat & crisp impressions..... Way too good creations!